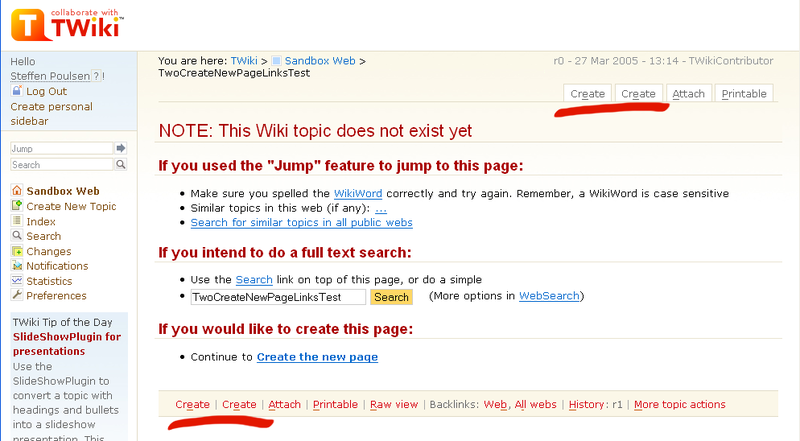 When using Jump or by other means getting the "This Wiki topic does not exist yet" two "Create" links are shown in the menu bars. I guess you have WysiwygPlugin enabled. The two buttons have the same text but they are not the same. The first has the pattern skin and the 2nd the kupu skin as parameter. This may actually be smart. We just need another text for the Wysiwyg Create and put that in the template. In view mode the 2nd button is WYSIWYG. So it could be "WYSIWYG Create" or "Create WYSIWYG" or "WYSIWYC" (what you see is what you create) or just "WYSIWYG"
Another thing: If you are not authenticated when pressing the "WYSIWYG"-button, and you are using the template based login mechanism, your login screen will be displayed in the "kupu" skin (which apparently falls back to plain skin p.t. ), and therefore is a bit tame compared to the login screen you get when pressing the standard "Create"-button. I can submit this as a separate item, if it should be fixed seperately.